The Nobel panel demonstrated the lack of foresight and thoroughly erred in choosing two personalities for a great honour. Ordinary citizens are no experts to judge the merit of a scholarly work that qualifies to win the Nobel prize in medicine, physics, chemistry, economics or literature. However, they can certainly judge the merit on which the „Nobel Peace Prize“ is conferred. Especially, for the contributions made towards achieving peace, protecting the rights of the poor and the most vulnerable and supporting the struggles for achieving just political and economic aspirations. Therefore, I consider the Nobel Peace Prize to be sacred – it must be awarded after thorough scholarly reviews. Clearly, on two occasions, the Nobel Peace Prize committee demonstrated the lack of foresight and thoroughly erred in choosing two personalities who do not even remotely deserve any peace prize, let alone the greatest of all. The two personalities are Myanmarese politician Aung San Suu Kyi and former US president Barack Obama, who were awarded the prized Nobel for peace. Take the case of president Obama. It was during the 2008 US presidential elections that my former mentor at Johns Hopkins University at Maryland had just returned to her office after voting for Obama. In other words, Obama’s presidency was a premise of hope for achieving peace and stability in the Middle East and perhaps in Asia and Africa as well. 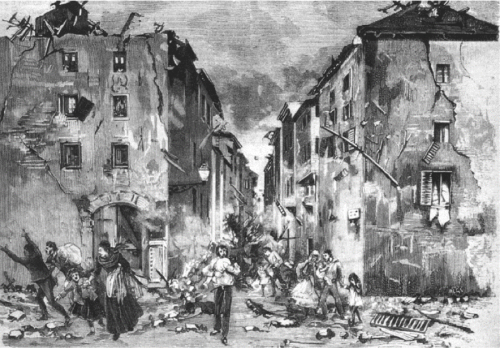 These regions have been plagued with chronic political instability, wars and famine – which, incidentally, were seeded during the colonial rule of British and French; more recently, flawed policies by the United States added to the chaos. Contrary to expectations, what Obama did was more shameful than his predecessors. During the eight long years of his presidency, Obama routinely and consistently signed orders for drone assisted extra-judicial murders of individuals living in the remote mountain regions of Afghanistan-Pakistan, East Africa and Yemen. The murder of individuals without proof of guilt and evidence of crime amounts to killing the spirit of the Nobel Peace Prize and humanity. As if the drone assisted murders were not enough, Obama ordered a direct military campaign in Syria – not to punish its brutal dictator over the use of chemical weapons against civilians but against suspected militants fighting the dictator who, under Obama’s watch, butchered hundreds of thousands of civilians and displaced millions. As a result, barely surviving and starving innocent women and children in Syria had to bear the brunt of US-led military assault. Obama did not relent from killing Syrians even in the last days of his presidency, which he ended with a murderous assault on a camp in Syria’s Idlib province – leading to the death of more than one hundred people. It is noteworthy his justification for the killings had been „an imminent existential threat to Western civilisation“. And, who are those threatening the Western civilisation and way of life, who deserve to die without proof of guilt? The answer is: an impoverished and famine-stricken people based in the inaccessible mountains and remotest corners of the old world and even nomadic desert tribes. Let us take the case of another Nobel laureate, Aung San Suu Kyi. She was conferred the Nobel Peace prize for her consistent struggle against the military Junta for establishing a democracy in Myanmar. It appears all her work for the foundation of democracy and peace in Myanmar was deliberately exaggerated by the Western media to the extent that it eventually backfired. On many occasions and on record she appears to be expressing no visible urgency to stop the genocide of the minority Rohingyas. More shockingly, she repeatedly defended government policies and rejects the notion of the Rohingya genocide. Under her administration, Muslim Rohingyas have suffered more killings and devastation. Thousands have been uprooted and forced to live under inhumane and horrific conditions in shanty camps, without access to health care and restrictions on reproductive rights. Tremendous disrespect and disrepute was brought to the legacy of the Nobel Peace Prize and the world’s consciousness when former US president Obama – an undeserving laureate – visited Myanmar in 2012 to re-establish diplomatic relations. And, then in 2016, Obama invited fellow undeserving laureate Aung San Suu Kyi to his oval office and rewarded Myanmar by lifting long-held US sanctions. I want to present these facts to the learned Nobel committee so that they can judge on what merit was the two leaders were conferred the peace prize. 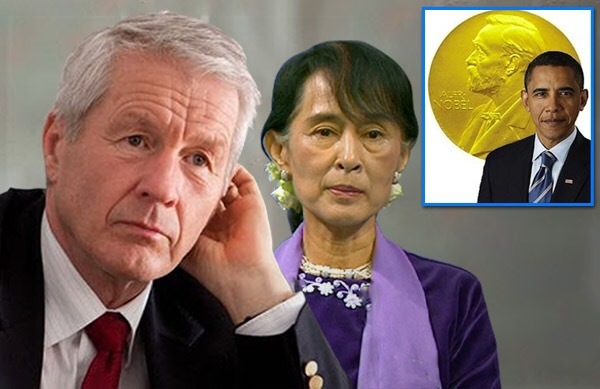 In order to maintain the sanctity of the revered award and the dignity of those who deserve to win it, the Nobel committee must demand the return of the prize from both Obama and Suu Kyi. 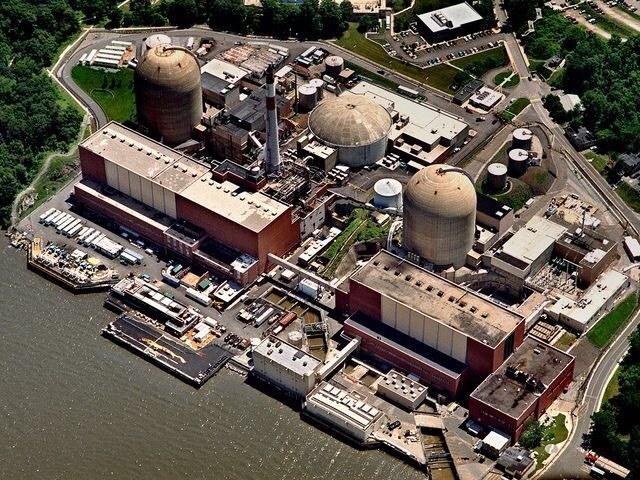 Indian Point’s owner, Louisiana-based Entergy, has taken „prudent, conservative action to shut down the plant“ to make repairs and identify what may have caused leaks of slightly radioactive water. „Corrective actions to address the causal factors over the years have not been completely effective at preventing recurrence of the issue,“ the NRC report states. „We will continue to follow developments involving the O-rings at Indian Point,“ NRC spokesman Neil Sheehan said. BEIRUT (Reuters) – Iran put a ballistic missile on display as thousands marched on Saturday to mark the anniversary of the 1979 seizure of the U.S. embassy, with a senior official accusing President Donald Trump of a „crazy“ return to confrontation with Tehran. Last month, Trump broke ranks with European allies, Russia and China by refusing to re-certify Iran’s compliance with its 2015 nuclear deal with world powers, reached during Obama’s tenure. Under that deal, most international sanctions on Iran were lifted in exchange for Tehran curbing nuclear activity seen to pose a risk of being put to developing atomic bombs. Iran has reaffirmed its commitment to the deal and U.N. inspectors have verified Tehran is complying with its terms, but Iranian Supreme Leader Ayatollah Ali Khamenei has threatened to „shred“ the pact if the United States pulls out. „All the governments confirm that the American president is a crazy individual who is taking others toward the direction of suicide,“ Ali Shamkhani, secretary of the Supreme National Security Council, told a rally in Tehran, state media reported. „Trump’s policies against the people of Iran have brought them out into the streets today,“ Shamkhani said. He did not identify the governments he had in mind. The other parties to the nuclear deal – Russia, China, Britain, France and Germany – have voiced disquiet at Trump’s opposition to it, fearing this could stir new Middle East instability. But the Europeans share U.S. concern over Iran’s ballistic missile program and „destabilizing“ regional behavior. Senior Iranian officials have repeatedly said that the Islamic Republic’s missile program is solely defensive in nature and is not negotiable. 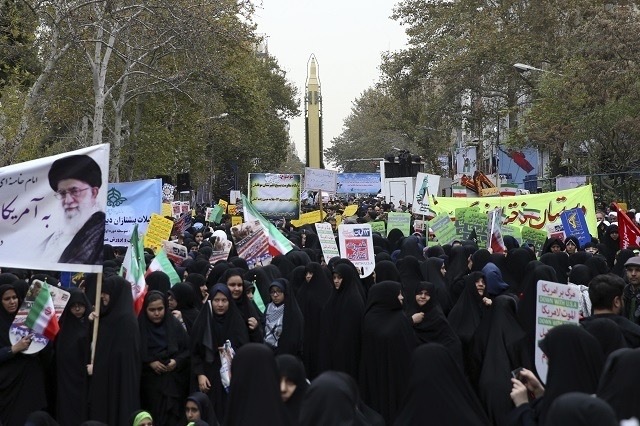 In a sign of defiance, a Ghadr ballistic missile with a range of 2,000 km (1,240 miles) was put on display near the ex-U.S. embassy in Tehran, now a cultural center, during Saturday’s street demonstration, Tasnim news agency said. „That America thinks Iran is going to put aside its military power is a childish dream,“ said Brigadier General Hossein Salami, deputy head of its elite Revolutionary Guards which oversees the missile development, according to Tasnim. Fars news agency posted pictures of demonstrators nearby burning an effigy of Trump and holding up signs saying „Death to America„. Iran and the United States severed diplomatic relations soon after the 1979 revolution, during which hardline students seized the embassy and took 52 Americans hostage for 444 days. Shamkhani spoke a few days after Khamenei said the United States was the „number one enemy“ of the Islamic Republic. U.S.-Iranian tensions have risen anew at a time when Tehran has been improving political and military ties with Russia. Russian President Vladimir Putin visited Tehran on Wednesday. Khamenei told him that Tehran and Moscow must step up cooperation to isolate the United States and help defuse conflict in the Middle East. Iran and Russia are both fighting on the side of Syrian President Bashar al Assad against rebels, some of them U.S.-backed, and Islamist militants trying to overthrow him.